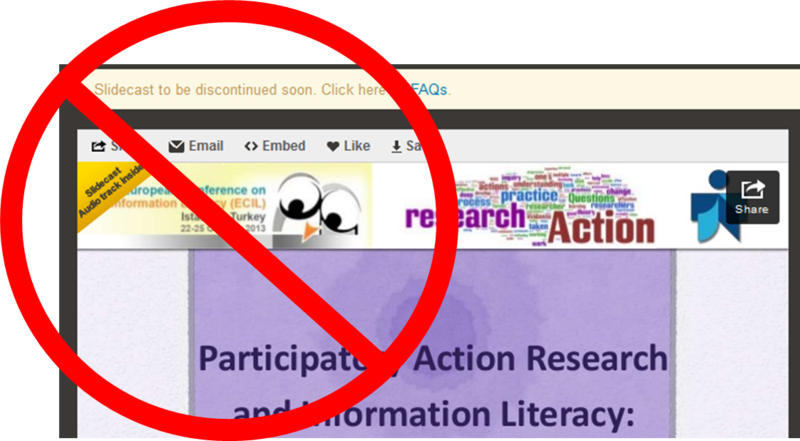 After the turn of the year, on February 7, Slideshare announced through its blog that slidecasts are going to be discontinued. Slidecasts are presentations uploaded to Slideshare that are synched to a MP3 audio file. While it’s relatively easy to create a slidecast, it may be seen as a niche practice, as some preparation and technical expertise is needed to do it, let alone the fact that Slideshare must be a niche social media site. For example, I used to do the presentation either with Powerpoint or Keynote and then record and edit its corresponding audio with Audacity or Soundforge. Hence, I suppose that only a limited number of Slideshare users have actually created this type of resource. Slidecasts have way more views than the presentations without audio: although my presentations have a quite low profile compared to those of other users, my normal presentations use to have hundreds of views while my slidecasts have thousands of them. I believe that is that shows the impact this advanced function may have. I think while static presentations are decentlly viewed, the amount of views slidecasts get show that they were a powerful type of media, not offered by any other social media site. This takes me to my other argument why this is a mistake. Slidecasts are (were) one of the best and unique Slideshare features, if not the most unique. I understand that by killing it they might be killing the service altogether. For me the most unsettling part of Slideshare’s announcement is that they state they are going to focus their energy instead “on building new and innovative ways for our users to share presentations”. I don’t want to be skeptic about innovating in social media but I wonder, is that even possible from the point of view of Slideshare, or is this just a sad excuse? You can already share presentations with your other social sites and embed any presentation on any site with an html string. Since February 28 you’re not able to create new slidecasts. You have until April 30 to download yours and not lose them. What options do we have to cover this absence? By now, I’m thinking of downloading the existing slidecasts I have and uploading them to YouTube and doing future ones using Camtasia or Captivate, although as you may be guessing after reading this post, I’m not very comfortable with the idea of giving more of my content to Google. In any case, I would recommend that you check out Slideshare blog and take a look at the post and the comments. Take a stand, if you liked slidecasts. By judamasmas in Opinion on 2014/04/15 .